Whenever I go hiking, I like to carry as little in my pack as possible without sacrificing anything that I really need. For me, hiking necessities include things like water, energy boosting snacks, some type of first aid supplies, sunscreen, and anything else that is season-relevant. Typically, I just toss these things into a daypack and then dig around to find them when I need them. But a couple of weeks ago I learned about VSSL Gear and the awesome canisters that they make for outdoor enthusiasts like you and me. They were kind enough to send me one of their VSSL Cache models (click to view at Amazon) with a few supply tins to test out. So, I hit up my local REI for some supplies and headed out to Red Rock Canyon to see how it would do on a hike – and to see if it really is “nearly indestructible” as they claim. What Is The VSSL Cache? What Can You Do With The VSSL Cache? Do I Recommend The VSSL Cache For Your Outdoor Adventure? 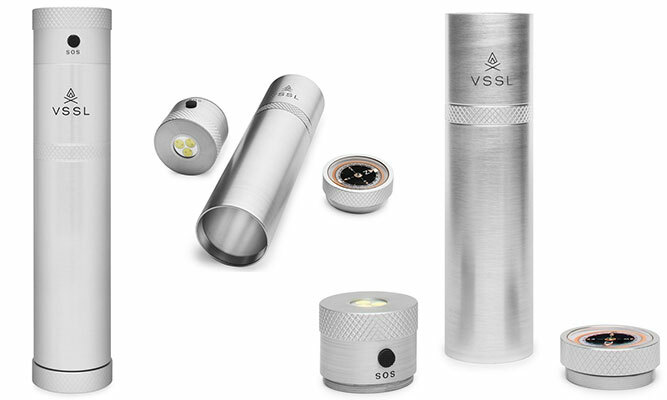 The VSSL Cache is a sleek, hollow cylinder that has an oil-filled compass at one end and a flashlight/SOS signal at the other end. And yes, that light is crazy bright, so don’t look at it! 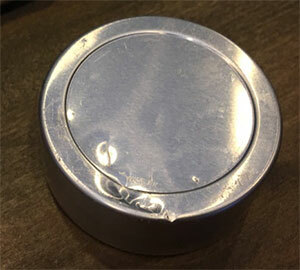 The cylinder comes completely empty, but you can also order empty tins for it. It is made of military specification anodized aluminum and is waterproof when securely closed. VSSL also notes that it is “nearly indestructible” – I tested this claim, so keep reading to learn how that test came out! Empty, this thing weighs around 12 ounces. When I first held it, I was a bit surprised by how heavy it felt and I had concerns about how much weight it would add to my daypack once I filled it full of supplies. 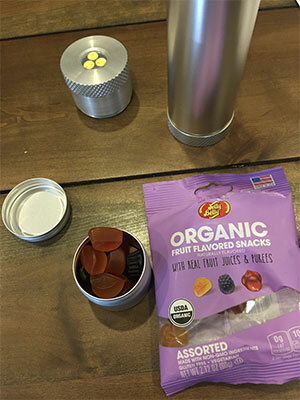 Using some of the empty tins, I added some almonds, energy chews, and fruit snacks to my Cache before adding in some necessary supplies for a hike. It did feel much heavier when packed. I tested it on the side of my pack and the added weight was noticeable. However, when I added it to the main compartment of my pack, I didn’t even notice the extra weight. In my testing, the fully packed Cache weighed in a 1.25 pounds total. I really like the size of the Cache because it is very slim, yet still holds a decent amount of supplies. It easily fits in one of those side mesh pockets on a daypack, though I found it more secure in the side zippered pocked on my Kelty pack. Since this thing is a cylinder, you have to carefully plan what you’re going to put into it. 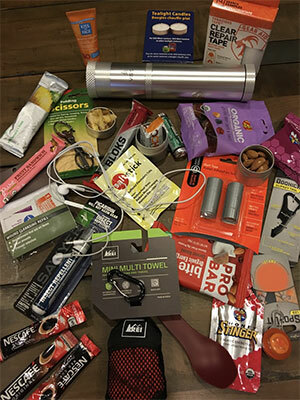 If you check out the stash of supplies I bought at REI, then you can see that I bought a LOT of things to test out in the Cache. And I tested packing it a few different ways – for instance, the tube of spray insect repellent only fits with two of the VSSL tins inside, but I can fit a ProBar energy bar with three of the tins and a few other supplies. I do want to point out that VSSL Gear actually sells some pre-packed cylinders, if you don’t want to do that packing on your own. They have one that is a VSSL First Aid, which is full of essential first aid supplies. And the VSSL Shelter is all you need for an emergency shelter. 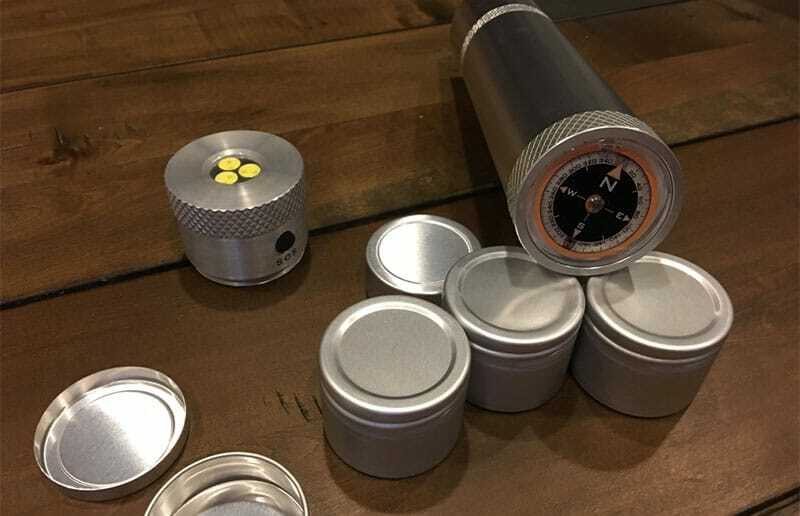 They also sell pre-packed refill tins for things like fishing tackle, first aid supplies, trail makers, fire starters, and water purification (among other things). Knowing that I was heading out to Red Rock when the temperatures were going to reach around 100F (sadly, a cool summer day in Vegas! ), I was a bit concerned that the heat would melt some of my energy snacks. However, I packed them anyways to test things out. I used a total of three empty tins, which I put in the bottom of the cache to make packing it easier. Not sure how many calories you need to fuel your hike? For most people, it’s going to be somewhere between 500 – 600 calories for an hour hike, on average. Of course, the weight of your pack will necessitate more calories, so keep that in mind. Outdoors.org has a good article on determining your caloric needs for your outdoor adventures. While testing out the VSSL Cache at Red Rock on one of the hiking trails last week, I had a little video made to document the experience. You see, I was most interested in testing out VSSL Gear’s claim of the cylinder being “nearly indestructible.” I know that under most circumstances, you” never have a reason to wonder about this. In fact, even if you are the most klutzy hiker on the planet, you probably aren’t going to give the Cache the same beating that I gave it. Seriously – I basically tried to wreck this thing. I tossed it down the trail incline, I kicked it, and I even threw it from the top of the canyon. You can see all of my shenanigans in the video below, where I also show you a few different ways to pack one of these for your next outdoor adventure. As you saw in the video, the VSSL Cache held up surprisingly well with the beating that I gave it. After the first toss, it got a little banged up on the outside, but that was it. Another toss, and the compass bottom must have landed just right on a rock because it earned a small crack. Another toss and a kick later saw that crack getting bigger to the point where oil was leaking out on my hands when I picked it up. But the final high drop onto the canyon floor is what really smashed up the compass – actual pieces of the covering (which seems to be a sort of plexiglass) actually chipped and fell out of the device. 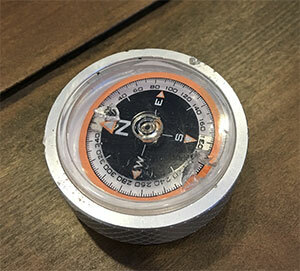 So, at the end of the day, the compass is now worthless. However, everything else about the cylinder is fine. Sure, the exterior definitely looks like some fool was tossing it around a canyon, but it is still 100% functional – except for that compass. The flashlight still works. It can still be securely closed, though you can tell that it is a bit more tough to do so. And, all my stuff inside was perfectly okay. Even though fruit chews that I was worried would bake out in the 100-degree weather were perfectly edible. However, one of my tins did end up with some indentations on it. I think that this only happened because my multi-tool was positioned directly above it. Otherwise, I think it would also be 100% okay. You can even see in the photo the indentation from the multi-tool, meanwhile all the other tins still look brand new. Truthfully, I’ve come to love this thing. The possibilities here are pretty much endless when it comes to what you can do with it. You could even buy one of these to leave in your car for emergencies. I’ve already come up with tons of ways that I can use my Cache, even though I broke the compass. Hands down, the VSSL Cache is the most versatile piece of gear that I’ve seen for outdoor enthusiasts. It’s compact, it can hold tons of supplies, and it truly is nearly indestructible. Plus, it’s actually pretty cheap for what you get. I only wish I’d had one of these packed with extra snacks when I was hiking through Waimea Canyon and the trail ended up being much longer than the amount of snacks I had with me. Though VSSL Gear does offer some pre-packed models, I highly suggest that you order one of these empty ones and fill it up on your own. Not only it is cheaper to do this, but you end up with exactly what you need when you’re out on the trail. And remember, the only real problem that you might have with it is that the compass may if you drop it a few times. So, pack yourself a separate compass just in case you end up being klutzy out there!